The T-bone pork chop was the one most seen on Texas tables. There was a time not too long ago when every Texas Café's breakfast menu would include a breakfast pork chop. The only pork chops I have encountered in some time in a café were the chops at Cooper's Barbecue in Llano. These chops were the size of a Sunday roast. You couldn't get a slice off one; you had to buy the whole thing. However, they were worth whatever they cost. They were juicy and tender all the way through. I suppose the pork chop fell off the front of the menu page when we had the attack of the fat doctors. All of a sudden anything with any fat content was as deadly as an Amazon poison dart. The fat doctors failed to mention that a three-ounce pork chop contains 190 calories, 90 calories of which are fat, while your heart-healthy beef rib eye in the three-ounce size contains 225 calories, 128 of which are fat. Pork chops vary in size and shape depending on the position on the spine from which they are cut and the local preference as to cut or size. An attractive package at the local meat markets is the "Assorted" mound of pork chops in the case. There will be two or three of the T- bone variety on the top of the mound and the rest will truly be assorted. It would be interesting to see if your butcher could put a name on each of them. The traditional T-bone chop was cut about three-eights of an inch thick. The home chefs country fried the chops. Pork was always over-cooked back then. My mama's pork chops bordered on the crisp side. They were delicious, but not exactly in line with today's concept of cooking meats. Today's pork chop should be no less than one-half inch thick and three-quarters of an inch would be better. As I am a high school graduate and earned my own living for a while, I finally figured that when I bought the bone-in pork chop I was paying as much for the bone as for the meat and the bone got throwed away. To the rescue came the meat packing industry and introduced the boneless pork chop. The boneless chop is actually a slice of pork loin, but it comes from the part of the hog where the regular chops are kept. Therefore, it is a chop. The boneless pork chop is my favorite part of the pig. It can be cooked in a variety of ways. My favorite method is pan-broiling. It's about as simple as you can get and produces excellent results every time. To pan-broil a boneless chop, or a regular chop for that matter, you will need a chop about three-quarters of an inch thick. It will have a small portion of fat attached. If you wish, you can remove the fat. Your cooking equipment is a large, cast iron skillet and a fork or a steak hook for turning the chops. Thirty minutes before cooking time, give the chops a medium dusting of Lawry's seasoned salt. Cover the chops and let them sit at room temperature until cooking time. Put a light coating of shortening inside your skillet using a paper towel or your fingers. Bring the skillet to heat just under the smoking point. Lay the seasoned chops in with a bit of space between. Don't crowd them. Pay attention here as this is where you learn to tell when your chops are done. As you handled the chops while seasoning them, you will have noticed they have a spongy texture. As your chops cook, the spongy texture will become more solid. Also, the chop meat will turn white as it cooks. If you have proper clearance on the chops, you can see the white color progress up toward the center of the chop as it cooks. When the white has moved to the center, it is time to turn the chop. As the cooking progresses, use the back of a spoon or similar to press on the meat so you can get the feel of the meat firming up. The chops cook in a hurry. It should take no more than five to seven minutes for the chops to be ready to turn. The second side will cook in less time. Your chop is done when it is white all the way through. If you have a good meat thermometer, you can check for an internal temperature of 150°F. The chop will continue to cook for several minutes after you take it off the heat and will reach about 160°F. This will give you a chop that is tender and juicy all the way through. There will be some crisping on the outside that really adds to attractiveness and flavor. If you are a bit curious about the cooking process of your chop, you can make a slit in it with a sharp knife to check the progress of the cooking. Put on an extra chop to use for the experimenting and the cook's treat. After about three cookings, you will be able to get the perfect scald on the chops just by looking and pressing on them. I hear a lot of complaints that pork loin comes out dry. If it is dry, you cooked it too long. In today's cookbooks, this is called country-fried. Season your chops with salt and pepper. Bring about a quarter inch of shortening up to frying heat in your skillet. Dredge the chops in flour, and shake off the excess. Fry to golden brown. Drain on paper towels. Serve with mashed potatoes and canned green beans. Pork chops are like beefsteaks. They do not want long, slow cooking. They want to be singed quickly over a hot bed of coals. Any of the chops will work on the grill. Just remember to oil the grill so the chops won't stick. You can use just salt and pepper or your most exotic seasoning. It's your call. At one time McCormick's made a "Grilled Steak Seasoning" that came in a little shaker bottle. It turned out the best grilled pork chops ever. Melt the butter in the boiling water. Add soup mix and rice. Put in a greased casserole. Place the chops on top. Bake at 350°F for one hour. I have been a member of the Camp Quihi Rangers for some time. The main purpose of the organization is to camp out at Capt. Conrad's place near Hondo and cook and eat various things. The Captain has a knack for cooking with Dutch ovens. 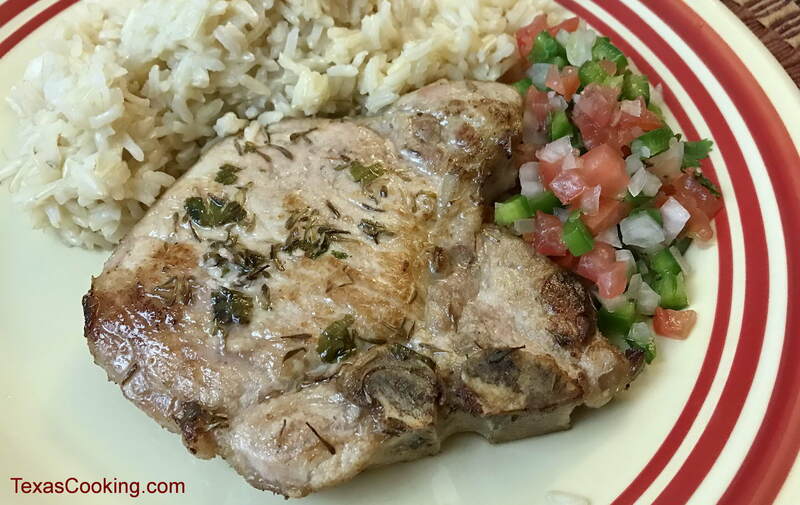 His pork chop recipe is a Quihi favorite. The pork chops are trimmed of excess fat and bone and seasoned with salt and pepper. The Dutch oven is heated to frying temperature and some of the excess fat from the chops is used to lubricate the inside. The chops are browned on both sides in the oven. When all are browned, three or four are left flat in the bottom of the Dutch oven. A drained can of sauerkraut is spread evenly over them. Next, the rest of the chops go in the Dutch oven and another can of drained sauerkraut spread on them. The lid is fitted to the Dutch oven and the contents brought to a slow simmer. (If you want to do this in the oven at home use about 350°F for the cooking temp.) Cooking time in the home oven should be about an hour, and outside a little longer. Check after an hour. Also check during the cooking time that the contents do not dry out. Add a tad of water as needed. The sauerkraut should cook until it is a bit crisp around the edges. This adds flavor. To me the kraut is just a bit sharp for my taste. I find that sprinkling a teaspoon of sugar over the top will remove the tartness. I think slicing a large sweet apple over the top of the kraut as it cooks would also take away some of the tang. One last point on the subject of pork or other meats, for that matter. When you have a cut that is removed from the carcass by way of a saw, there will be bone dust. It's just like the sawdust you get when you cut wood. The better meat vendors will remove the bone dust from their product. In the high volume stores, don't expect that nicety. Use the edge of a knife to scrape the meat. The bone dust will show up as a mound of white, grainy substance. The bone dust is not harmful; it just cooks to grit when it's not removed.